A customer came in the other day with a number of limited edition prints and original artworks that have suffered damage from the materials that were used to frame them. 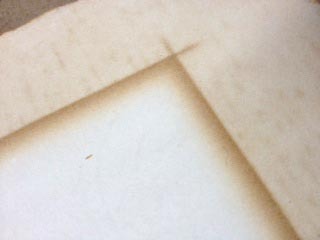 The prints have the outline of a brown line- appearing as though someone has spilled coffee on the edge of the paper, and allowed it to make a ring around the opening of the mat. This is what is referred to as ‘acid-burn‘. The acid-free materials that are most commonly used today were not always available. It is only the last few decades that acid-free paper has been widely available for framers and artists. The prints the customer brought in were framed sometime around 1979, and each print has varying degrees of acid-burn. Some are discoloured more than others, which may be a result of a number of variables – such as humidity and temperature. The prints were also damaged on the reverse side. 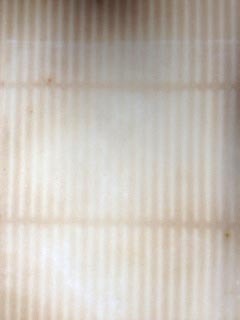 Cardboard was used as a backing, and you can clearly see the markings of the corrugated lines that were touching the paper. Cardboard is a very acidic material, and whenever possible, should be avoided when framing artwork. At Framagraphic we mount your artwork in a manner where there everything that touches the art is archival and acid free. We contacted Rebecca Pavitt, a conservationist whose clients include the Belkin Art Gallery, Vancouver Art Gallery, UBC Special Collections, along with a number of private local galleries. We are looking forward to seeing how her treatment will work for these prints. Rebecca is also an avid writer for Preview’s Conservation Corner. In her articles, you can read how she approaches some of the challenges that are inherent in working with such delicate material.